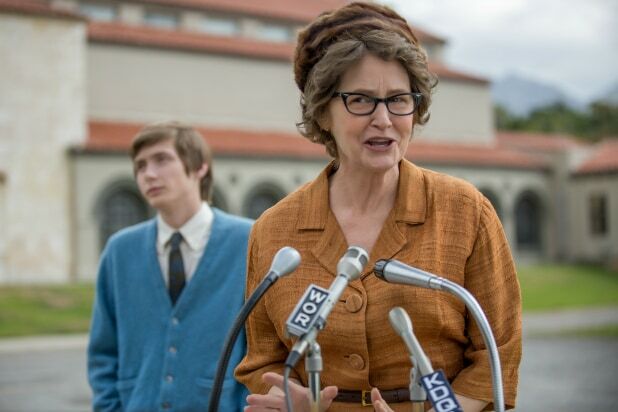 For a film to do justice to the life of America’s most famous atheist, Madalyn Murray O’Hair, it would need to be serious, salty, inspiring, rabble-rousing and not a little bit creepy. She was, after all, a victor in one of the most controversial Supreme Court Cases of the ’60s — ending compulsory Bible reading in public schools — as well as the founder of a movement of non-believers and, in the end, the victim of a most ignominious crime. Signs of life interrupted in an empty Austin house open the movie, which begins in August 1995, when the 76-year-old Madalyn (Leo), her adult son Jon (Michael Chernus, “Orange Is the New Black”), and granddaughter Robin (Juno Temple) were all kidnapped and taken to a house in San Antonio. First shown with bags over their heads, Madalyn’s voice snarls out “Did Jerry Falwell put you up to this?” The reality, though, is that their chief abductor, David (Josh Lucas), is known to O’Hair, and his million-dollar ransom demand suggests knowledge of money the family has kept off the books of her non-profit American Atheists. Meanwhile, a concerned young Atheists employee named Roy (Brandon Mychal Smith, “You’re the Worst”), stymied by a police department that believes the O’Hairs are just on an extended trip, contacts a San Antonio reporter (Adam Scott) to look into the family’s disappearance. The first clue that something’s fishy: Madalyn’s beloved dogs were left behind. But even her oldest son, Bill (Vincent Kartheiser), long estranged and a Christian convert, isn’t eager to help when contacted. O’Hair relished the chance both to insult the faithful personally or on television (Leo is inserted into Phil Donahue and Johnny Carson clips) and to sue, sue, sue to be heard. But O’Haver’s biopic style is the highlight-reel version, big on recreated TV spots and busy but brief scenes, with an emphasis on the cheeky over the introspective. Atheism as a counter-political religious freedom movement is rarely explored beyond a sound bite in O’Haver’s and Irene Turner’s scattershot screenplay. What gets the most screen time is the melodrama of Madalyn’s suffocating, mistrustful treatment of Bill — whose hatred for his guilt-tripping mother grows with each swig of whiskey — and the poor management of her organization, since these threads more directly affect the kidnapping saga, the shallowest and least interesting part of the movie. Taken on blunt terms, Leo is the right performer to play O’Hair; her barbed tongue and unkempt mien are engrossing enough, but a deep portrayal, it’s not. Kartheiser, back in “Mad Men”-era threads, has the occasionally effective moment as Bill sours to his mother’s psychodrama, but he’s mostly ill-served by the general weightlessness. The rest of the cast is wasted, from Temple’s blah mousiness to Scott marking time expositorily as the reporter. In the final act, Lucas’ David becomes the movie’s prime antagonist, once his connection to O’Hair is revealed, but there’s little beyond generic menace in the character, and the movie limps to its gruesome conclusion without ever really justifying the emphasis on it. “The Most Hated Woman in America” is ultimately a simplistic approach to a fascinating figure, more Lifetime than a woman’s life and times. 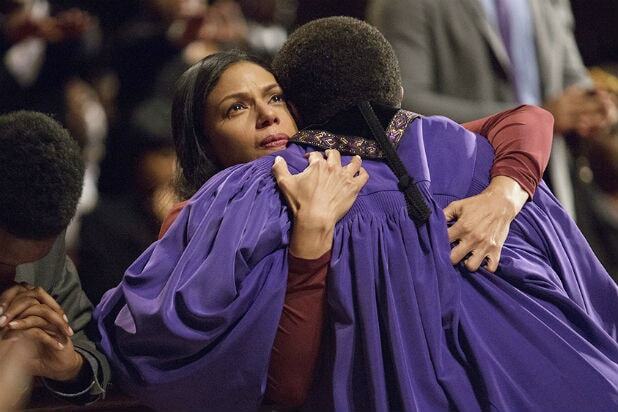 Picked up from OWN, "Greenleaf" is the story of a megachurch family and the tensions that underlie their commitment to faith. Starring Lynn Whitefield and Merle Dandridge with appearances by Oprah, this show is sure to take you along on its emotional rollercoaster. What's Coming March 7: "Amy Schumer: The Leather Special"
America’s love affair with Amy Schumer continues with her new special airing on Netflix. Using her signature unapologetic style, Schumer takes on topics such as relationships and her unusual rise to fame, from her set filmed at Denver’s Bellco Theater. One of the most highly-acclaimed Netflix originals, "Love" returns for its second season. Navigating the ins and outs of millennial dating, "Love" portrays reality in a refreshingly different way. What's Coming March 15: "The BFG"
The movie adaptation of the beloved children’s novel makes its appearance on Netflix this month. Visually stunning and emotionally poignant, this series is sure to make you nostalgic for your childhood. Steven Spielberg directing Roald Dahl? A match made in heaven. What's Coming March 17: "Marvel's Iron Fist"
Starring Finn Jones as Danny Rand, "Marvel’s Iron Fist" is the latest installment in Netflix’s Marvel adaptations. After being adopted by a family in the ancient Chinese city of Kun Lun, Rand returns to New York City to use his mastery of the martial arts and the mystical “Iron Fist” to fight crime. Arguably one of the most binge-able shows on Netflix, "Vampire Diaries" gives fans their 8th seasonal dose of blood, lust and the drama. Get ready to join Annalise Keating (Viola Davis) on her third season of legal shenanigans, scandal and crime. Golden-Globe nominated "Grace and Frankie" returns for its third season. Fans can look forward to more endearing humor and quirky one liners, as well as Peter Gallagher as a guest star. Fonda and Tomlin will undoubtedly continue to impress, as the show cements itself as one of Netflix’s most popular. What's Coming March 31: "13 Reasons Why"
This adaptation of Jay Asher’s bestselling novel and Selena Gomez's "passion project" is one of the most anticipated series for this month. This story follows a group of teenagers as they try to uncover the reason their classmate committed suicide, by listening to individualized cassette tapes she left for each of them. What's Going March 1: "Jaws"
It'll be safe to go back in the ocean next month, as all four movies in the "Jaws" film series will be leaving the streaming platform on March 1. What's Going March 1: "Animal House"
John Belush, Tim Matheson, Peter Riegert, Thomas Hulce and Stephen Furst star as a misfit fraternity in John Landis' 1978 "National Lampoon" spin-off. What's Going March 4: "The Nanny Diaries"
Before they were in Marvel's "Avengers" together, Scarlett Johansson and Chris Evans co-starred in this 2007 romantic comedy.